A sunroof that is broken is one that fails to do what it is supposed to do, and it can begin to be more than a bit of a hassle. There are three main issues that would necessitate a sunroof repair. The first one is that it can have a broken part or two, the second is that it can get jammed, and the third is that it can begin to leak. 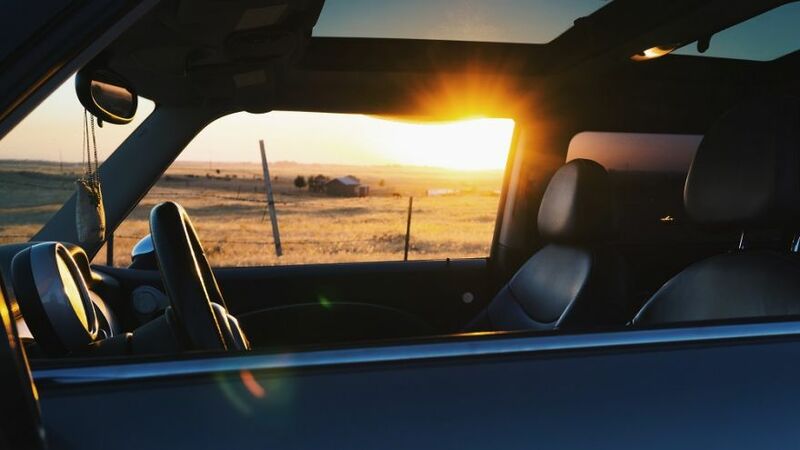 Sunroofs were designed to allow fresh air into a vehicle for the passengers, or to let the light from the sun into the vehicle. Many vehicles these days are equipped with one. 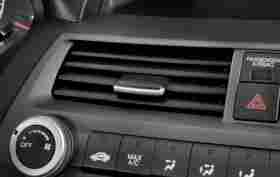 A sunroof can be automatic or manual, and this can depend on the model and make of the vehicle it is in. If your vehicle doesn’t come with a sunroof, you might even decide later on to have one installed. 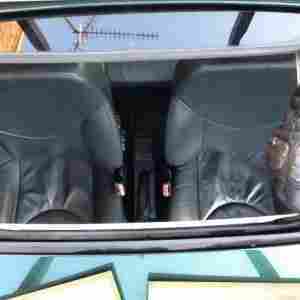 Typically, a crack or leakage in the sunroof means that you need to get it repaired. If there is a crack, the best thing to do is to get the sunroof replaced because repairing it will still not make it what it used to be. Leaks, on the other hand, tend to be caused by debris or dirt accumulating on or around the seals, and may even be cause by water that is clogging the drain pipe. The cost of fixing a sunroof will depend on the type of sunroof it is and the model of the vehicle. Different vehicle manufacturers install different types of sunroofs and this means that there are variations in the price of them. The cost also depends on the part that is being replaced. If you decide to get a professional to fix the sunroof as opposed to fixing it yourself, you will also need to figure in a price for labor. This alone might be anywhere from $200 – $250. However, if you are comfortable with replacing it or repairing it yourself, keep reading. There are quite a few different models of sunroof installation kits out there. You need to choose the right one for your vehicle. Once you have found and bought the right one, check to make sure that the manufacturer included all of the necessary pieces. Put the template that came in the repair kit on top of the hole for the sunroof. It should be a perfect match for the hole that is the sunroof. This will allow you to have a good idea of how the work will be done and where you need to be focusing. Take the old and broken panel of the sunroof off the car. Take a close look at each of the pieces to determine whether or not they work and why the panel stopped working in the first place. Look into the edges of the roof around the hole for the sunroof too. Try to find out if there are any parts in the actual roof that might also need to be replaced. Crank open the roof using your 4 mm hex socket so that you can get a proper look at whatever the fault is with the old sunroof. It won’t be possible to completely open the sunroof once you push the headliner behind it, so you need to determine if that will be needed or not before you proceed. 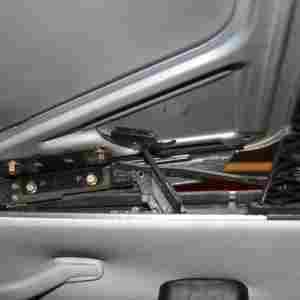 Once you have located the parts that you need to replace in the broken sunroof, take that one out. Fix any broken part that you can get to. Once you are ready to put the repaired sunroof back in, you might need to make a small alteration or two to ensure a perfect fit. Check the seals for any signs of leakage and you are done! If your sunroof ever jams or just stops, or even starts making weird noises, STOP WHAT YOU ARE DOING TO IT! Don’t try to close it or open it. Typically, the cause of a sunroof that jams is that it just needs a bit of maintenance. The tracks can get clogged with debris or dirt, or even with axle grease that has hardened. When issues such as these get too bad and you force the sunroof closed or open, it can lead to a worse issue – the cables breaking. If the cables in your sunroof are not broken, this will be easy to fix. The first thing you should do is to cover the interior of the vehicle with a drop cloth to keep the mess from the sunroof into the car. Allow yourself room to get right under the sunroof opening inside the car though. Next, without moving the sunroof, spray a bit of carburetor cleaner in, on, under, and down the track. Be extremely careful when doing this that you don’t get any of it on the vehicle’s paint. You should also spray this in the groove of the top of the sunroof. Now, you will need to take a Phillips head screwdriver and take out the two screws that are right at the front of the headlining panel that slides. This sliding panel will be on the inside of the headliner. 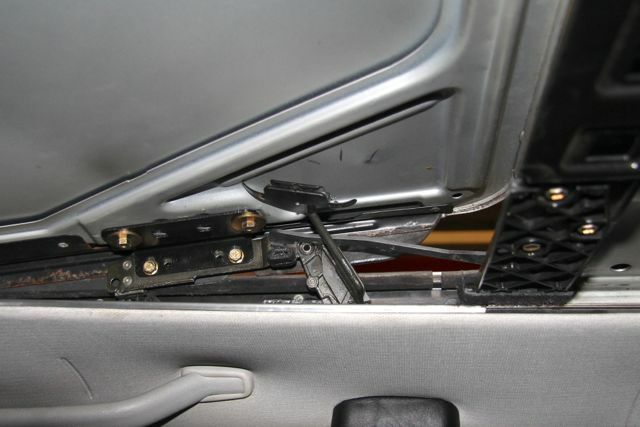 The material on the sliding part of the sunroof is stretched around the frame and is held in place by those two screws. Now, grab onto the frame and gently pull it forward, ONLY PULLING ON THE HEADLINER AND FRAME. The actual sliding roof should not move. When you have that loose, push the headliner to the rear until you are able to see the bottom of the sliding roof. Underneath the sliding roof on both the right and left sides, you should be able to see a cable that is used to pull that sliding roof. This cable should also be cleaned with the spray. Then, you will need to lube it a bit with a Teflon grease spray, such as White Lithium Grease. This part might be a bit messy, but it will allow the cable to slide smoothly. Lube up the remaining parts of the tracks and then try to open or close it again. If it still doesn’t work, you need to clean it a bit more. In fact, you might have to repeat the entire process a few times for it to work. 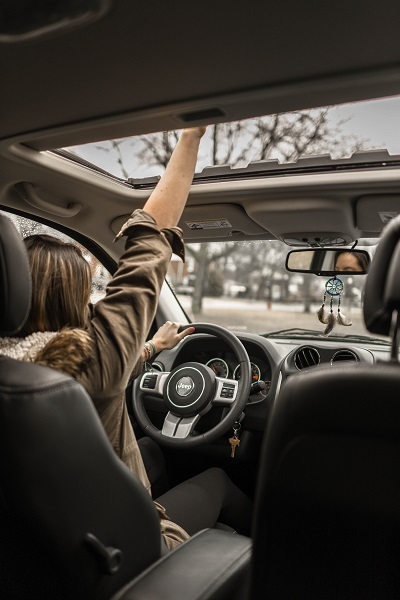 If you aren’t sure if the motor of the sunroof is working, the easiest way to find out is to take it out of the vehicle and test it with a battery. You will need to unzip the access in the headliner and remove the motor’s 3 wires. You will also need to remove that long cable that joins the driver to the motor as well as the 2 10 mm nuts that are keeping the motor in position. Once you have removed and bent back the 4 tabs, you can remove the cover plate and the gasket, which will allow you to see and get to the motor of the sunroof. Lube all of the parts and then check the motor to see if it turns. Take a bit of sandpaper and use it on the central motor spindle so that you can get rid of any debris and/or rust. The outside of the cover plate should be stamped to show if the motor is 6V or 12V. You will notice 3 different wires coming from the motor. The blue one is the ground wire. The green one is to power open the sunroof, and the black one is to power close the sunroof. Take the blue wire and touch it to the negative end of a battery and then touch one of the other wires to the positive side one at a time. When you do this, the motor should begin to work. If it doesn’t, it will need to be replaced. If you aren’t sure if the switch for the sunroof is working, the best way to find out is to check the wires that go to it. 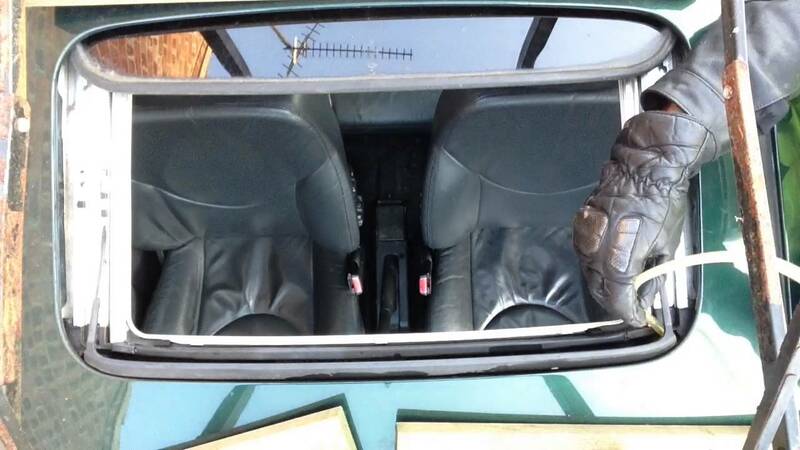 To accomplish this, you will need to get under the dash with a 10 mm socket and a Phillips head screwdriver. You will find the switch for the sunroof on a support bar that is black. Take the 10 mm nut off the back of it and then remove the screw at the front of it. Under the switch, there ought to be 3 wires. The one in the middle should be a thick gauge wire that is red and should connect to a fuse. The other 2 wires (one should be red and the other should be red with stripes) should go back to the roof, where they plug in to the green and black wires on the motor of the sunroof. In the roof, there should be a dual connector – black to black. Once you have the wiring done correctly, you can remove the cable that is between the driver and the motor. Then just hit the switch and see whether or not the motor turns. If the motor works at this point, the switch and the wiring are ok.
You might have water on the seats of your car right underneath the sunroof, and you want to make sure that it doesn’t happen again. If you are thinking about taking matters into your own hands, put the caulking gun down and slowly back away from the car. Typically, the issue with a sunroof that leaks is a drainage tube that is clogged with debris or dirt. When this happens, the water isn’t able to drain away and it can overflow and leak into the car. Don’t worry though because the repair for this is a simple one that only takes a few minutes. The first thing you will need to do in order to fix a leaky sunroof is to make sure that the glass panel that is on the roof of the car is clean. Use a cleaner that is non – abrasive and a wet rag or cloth. Next, open up the ventilation shade and then the sunroof itself. Watch the seals closely during this part. If you notice that there is any dirt or debris anywhere that prohibits the sunroof from closing tightly right at the seals, that area will need to be cleaned with your wet rag too. Take a good close look at the seal and try to determine if the seal has any sort of crack(s) in it. If there are cracks, you will need to replace the seal because this is what is causing your sunroof to leak. You also need to inspect each of the drainage tubes. Check for things like stagnant water and/or clogs. If you find any, you will need to unclog them using either a thin wire cable or a wire coat hanger that you have bent into more of a straight line. If you want to ensure that there aren’t any more clogs in the tubes, try inserting your wire in the tubes and pulling it back out in a few seconds. You might also try pouring a bit of water into each of the drainage tubes to make sure there are no more clogs. If you try all of these things and are still having issues, you might want to take the car in to have it fixed by a professional.